Against And Forward / Вперед Вопреки Всему: The Many Faces of Love. Part 2. Dark Romance / Разные лица любви. Часть 2. Темная сторона. The Many Faces of Love. Part 2. Dark Romance / Разные лица любви. Часть 2. Темная сторона. Love is not always all pink and cute and romantic. Sometimes it also gets ugly. And heartbreaking. And abusive. It has you lose your joyousness and carelessness. It rips your heart apart and makes you hurt. It has nothing to do with those fairy-tales and Prince-Charmings. It makes you lonely, it drowns you. Sometimes it even kills you. 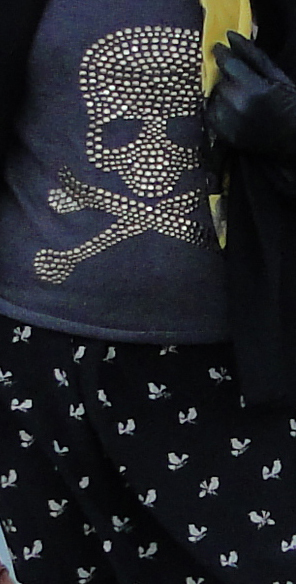 My outfit of today is a grey sweater with embroidered skull on it worn over a silk girly dress with a songbirds print. I wanted to keep the color pallette dark and leave the job of providing contrasts to the prints and materials. As for makeup, my choice went to smoky eyes. Not my favorite look, but definitely The One for a theme of dark romance. Сегодняшний образ - мой взгляд на романтику в темных тонах. Серый грубый свитер с черепом поверх шелкового платья с рисунком в виде певчих птиц. Черно-серые тона. Все остальное - в контрастах тканей и текстур. Очень милый образ, мне нравится все!